The Ruger LCP hit the gun market like dynamite. When the diminutive gun started showing up in gun advertisements and word began to get around, the demand for the new small .380 was enormous. Concealed carry laws across the country have been implemented resulting in more demand for smaller and smaller guns. Ruger's name coupled with the timing of the release of the little auto pistol created a hugely successful marketing campaign. The downside to the whole brouhaha was that you couldn't find the guns anywhere. For the first year after they came on the market, if one did happen to show up on store shelves it was gone in minutes. Also, the Ruger LCP seemingly improved the dependability issues found in it's counterpart, the Kel Tec P3AT. Videos put out by Ruger showed random guns taken from the manufacturing rack firing dozens of rounds each, rapid fire, without any failures. Ruger appeared to have a solid winner in this immediately much in demand gun. That said, as with most things new, something was awry that didn't show up until thousands of the new .380 were in circulation. In a "small number" of the guns, it was determined that dropping them on the muzzle with a round in the chamber caused them to fire. Can you say "recall"? Thousands of the guns were returned to Ruger to be "fixed" and a quick second generation of guns was manufactured with the misfire issue fixed. The gun remained in high demand and after over 3 years on the market they were still not commonly found on shelves, but were periodically available at large retailers. This is another small gun that I have not owned but have shot. I have three friends that own them. Consequently my range experience with them has been considerable. That experience with the Ruger was satisfactory, but far from exceptional. At about 25 feet I was able to keep all 6 shots inside a 10 inch target with smooth, repeat firing. Once the sights were lined up, I was able to easily bring the gun back on target after each round. The gun caused a bit of finger pain but not enough to be of particular concern. With a design that is basically copied from Kel Tec, I don't know exactly what it is that makes the gun more desirable to shoot, but it is. And inherent accuracy appears to be better. Dependability is definitely an improvement though the little Ruger LCP is not without its periodic dependability problems. A recent test of 10 sub compact 380s turned up dependability problems with all but one of them. The one that performed perfectly was a Rohrbaugh. None of the other nine, including the LCP performed perfectly. 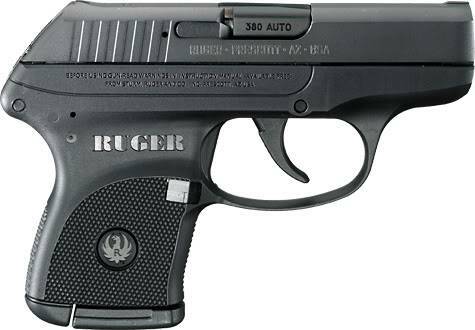 But the ones I know of personally have had no issues and the Ruger LCP .380 seems to have a better overall reputation for dependability than most in this size. On another negative note, Ruger has been significantly castigated for blatantly copying Kel Tec's design. There was even word of trade legalities and legal issues arising from the production of the LCP. I don't know about all that, but it is clear that Ruger has built its gun on Kel Tec's platform. It's also clear that Ruger improved the gun. So, I really don't care and will let the gun companies fight that out. My concern is who has the best gun overall. And at this point, that appears to be Ruger. The little .380 is 9.4 oz empty which is slightly more than the Kel Tec, possibly accounting for the better overall feel. The barrel is 2.75 inches, magazine capacity is 6, sights are fixed, and while Ruger doesn't list the trigger pull weight on its web site, the trigger is comparable in feel to the Kel Tec P3AT. What would I do? I'm not generally a fan of this size gun and its inherent usability issues. All things considered I still would not choose one in spite of the existence of the LCP. If I were in the market for one, this would be it. 2018 Update: This would still be the one.